Condensed milk is made by concentrating the milk till it reaches a thick consistency, it can be unsweetened or sweetened but in today's world condensed milk is equated with the sweetened variety. It is very luscious and rich due to the fact that most of the water content from it is removed. There are so many things one can make with this pale liquid, from all sorts of sweets and confectionaries to full-fledged desserts. It can be used as a topping, a dip or even as an egg replacer in certain recipes! Condensed Milk as an Egg Substitute. 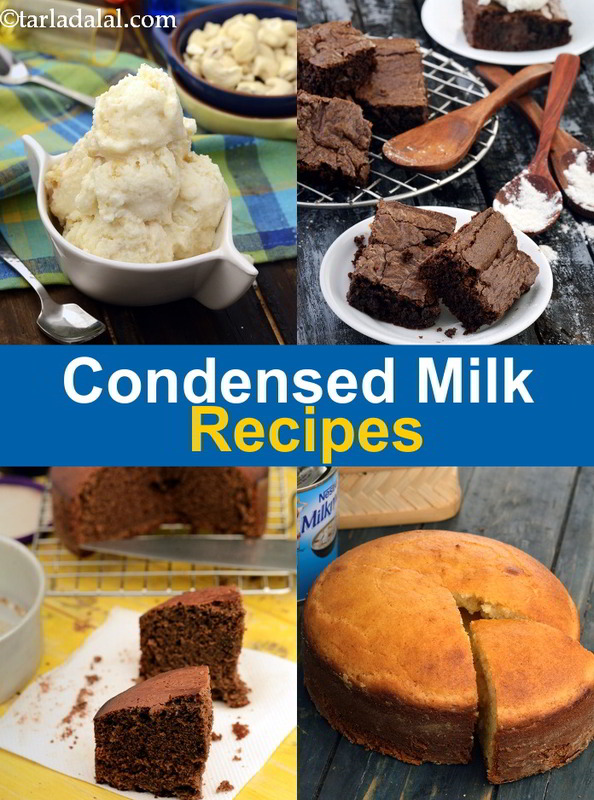 Due to its texture and smoothness, condensed milk is used as a substitute for eggs in many cake recipes. From making the basic Chocolate Cake to a more complicated Marble cake, they both will turn out soft and gooey, even loaves like the Orange and Tutti Frutti Loaf taste delicious. It is not necessary that you only have to bake them in an oven, condensed milk recipes also work very well for pressure cooker cakes like Eggless Vanilla Sponge Cake and Chocolate Pudding. You can even make super simple 2 minute microwave Chocolate Mug Cakes that are perfect as a party dessert or some comfort food craving. Indian Desserts using Condensed Milk. Everyone around the world knows about India and its love affair with all things sweet. All the late night cravings, festival food or may it be a street food, no meal is complete without these sweets. But a lot of times most people are afraid to make these desserts at home for the fear that they won't turn out right, which is far from the truth. One of the favorite desserts of Indians is the famous Malai kulfi, which even though takes a long time to make, only consists of a few steps which are not very complicated. Similarly, you can make variations to the kulfi by making a Banana and Apple Kulfi or any other fruit kulfi. Other Indian desserts that are absolutely delectable and can be made with condensed milk are Shahi Rabri, which is simply made with paneer, milk and condensed milk and flavored with saffron or a quicker version of it called Instant Rabri. The Bengali classic Mishti Doi is made by sweetening thick curd and fresh cream with condensed milk and baking it. The southern states use this luscious milk as well while making a festival special called Gil-e- Firdaus which is a hyderabadi rice kheer. Making ice creams can seem such a tedious task and what if you don’t find the flavor you are looking for? We promise you making Ice-cream is really easy and much more delicious than the store bought variety. The addition of condensed milk not only adds sweetness, but also makes the icecream very rich in taste and texture. Few of our favorites are the Butterscotch Ice-cream with the praline shining through and Rocky Road Ice Cream, which is crunchy and has bits and pieces of nuts to make it more interesting. If fruits are your calling, you can make an array of fruit based Ice creams with condensed milk like Fresh Mango Ice Cream, Orange Sorbet or Fig Ice Cream. Other than the mainstream, condensed milk is versatile enough to be used in truffles, mousse and also pies like Banofee pie. A simple vanilla songe cake use in a different desserts.